One of the reasons we bought our house was because of the enormous walk in pantry. It can hold SO much food! Lots of shelf space, lots of storage. My pantry was not being well utilized! Also, our pantry has tons of room up top, and we could easily add another shelf for storage. I really dislike having no color on the walls. Off to Lowe's I happily went to buy lumber, and some paint! Glass Jars from Walmart, vinyl labels from Say it on the Wall. I LOOOOOVE my glass jars. They are my *favorite* part of my new pantry. They have been AWESOME for holding all my baking stuff. We cook. ALOT. So, we have about every spice or seasoning known to man. This was purposely put on a high up shelf, out of reach of my little ones. Sorry Miss J and Mr. A! Large Glass Jars from Walmart and Goodwill. Notice that you can SEE all my canned goods. I made simple "risers" out of some 2x4's I had laying around. I stacked three 2x4's to raise up the very back row. For the middle row, I stacked two 2x4's. The front row sits on the shelf. A CHEAP and EASY solution for canned goods. I LOVE keeping my pasta in these containers. (they are from walmart, and are supposed to be for cereal). You'll notice the container on the left has spaghetti in it. I saw this genius idea on someone else's blog. I can't tell you how many times my spaghetti has spilled all over the floor. The box would never stay closed! Not anymore! Take everything out of your pantry/cabinets, and start fresh. Have all labels on cans, bottles, etc face outward. It looks clean and organized. Get can risers (or MAKE them) for canned goods. It makes a huge difference! LABEL everything. Even if you think it's silly, it will help you stay organized. Paint can do wonders. It really brightened up my space. Be consistent in putting stuff back where it goes! Other GREAT pantry projects to check out!! I am drooling! I love (am so jealous!) your pantry. I currently don't have one but its on my list when we get around to buying a house. You did a great job in organizing and the color is beautiful! What a fabulous pantry. I get all my spices in bulk too. I honestly think that having a good spice supply is one way to encourage eating at home. hope you have better luck with bugs than we do- those walmart glass containers have not been our friends for flour. The pantry looks great though!!! Oh how this appeals to my organization OCD! I Love bins and containers. Seriously The Container Store is like heaven. I wish they were cheaper. I think your pantry looks amazing. Great job with the painting and finding a place for everything! Love it! What are the the dimensions (sq ft) of your pantry? I have what seems to be a pretty deep pantry, but it currently has very deep shelves that get disorganized easily. I'm considering narrower shelves like yours. I love a pretty pantry. Yours looks fantastic. 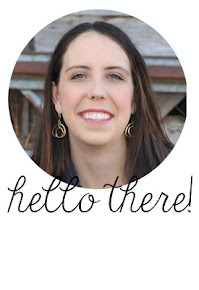 I'd love it if you'd link up at my Home and Family Friday linky party. I'm your newest follower. Wow! I mean, Wow! What an amazing difference. I just love the glass jars. I have my pantry about half organized (some baskets and jars) and now I feel like concurring the rest of it! Now that's nice! Great job, I love the glass canisters! This is amazing! I love all your glass jars! I love your pantry make-over. I just cleaned mine out but it needs a face life. The only way I keep it organized was by putting labels on the front edge of the shelf. That way everything has a set place, husband and kids know where it goes, and it helps me make a grocery list. Functional but not anywhere as pretty as yours.. I have pantry envy. Thanks for sharing. I really love your pantry. I know it took alot of work but the payoff was hugh. LOVE the containers, the vinyl, the labels, the spices in the mason jars, and the baskets. I wouldn't leave the pantry if mine looked like that! I have a similar vision for my pantry at my soon to be new house. I liked your idea for cheap risers and mason jars! Thanks for sharing! It look great! I am jealous of all your pantry space! So jealous of your pretty pantry!! I have a large floor to ceiling cabinet pantry - but I dream of one like yours!! I really like the 2x4 tip for canned goods. That is something I can try to adapt for our pantry!! Thank you for sharing this! When I saw the first shot of the "before" photo, I thought, "how'd my pantry get on this blog." Seriously, that's EXACTLY how my pantry looks!!! Now if I can only get it to look like your after! What a great looking pantry! I'd also like to hear how things to with flour in the glass jars. We have to store ours in the fridge. im crying because i have no pantry!!! thats a beautiful not our mommas pantrys! I have a pantry that looks very similar to yours in size..it is a walk in and I love it but it is all white! Never thought to paint it! I wrote down your paint color and I am painting it Butterfly Bush today!!! I love that color! My kitchen is red and my pantry is right off my laundry room so I think the red and yellow will blend nicely! I also love love love those labels on your canisters...thanks so much for sharing! I love everything you did!!! Looks awesome! I love an organized pantry! Awesome organization! And great idea to date your spices! I'm always wondering how long I've had that nutmeg or whatever . . .
Looks like a pantry from a magazine! I absolutely love all the little baskets and jars to make everything easy to find! It looks great! WOW it turned out great. What an inspiration. Wow this looks great! I wish I had that space! You have totally inspired me:)!! GREAT job and it looks so easy to access:). Very pretty! We built a room for a pantry in our garage; I wanted to paint it, but my husband didn't, so it's not painted. It, however, organized! I have been reorganizing it and I plan to put up new photos of some big changes soon. My pantry photos are two years old! I buy spices in bulk as well. I also buy flour, wheat, sugar, beans, rice, popcorn, and other things in bulk, so those are in 6 gallon white buckets with gamma seals. It's not as pretty as yours, but it is practical; I love how beautiful yours is! Could you please tell me where you got that fabulous acrylic looking spice stand? I love how you can see all your spices lined up? Thank you sooo much! I got the acrylic spice rack at The Container Store. I love it! I made the labels for those spices using clear address labels that you can print with any normal printer. It came with generic labels, if you want to use those. Good luck, and thanks for stopping by!! Sheri, also, I would LOVE to see a picture of your finished pantry! You could e-mail it to me at alittleofthis.alittleofthat.blog@gmail.com. Would love to see it! I totally forgot that BB was an olympic color, and I had it mixed w/Valspar paint. Sorry about that!! WOW!!! That is one incredible pantry! I'm definitely feeling inspired! I got Ball jelly jars for my spices...I purchase in bulk also...I love getting them out of their little plastic bags and into a more useable container. (also, I bought a bunch of spices, wrote the PLU number on the tag to purchase them...and didn't write the name...can you imagine how much they look alike!!! Also...I found those glass jars at my local WalMart today marked down to $10...I got 2, and regret not buying them all! You have inspired me! I may have to try to redo my pantry. Good job! I too am jealous! Great job transforming it! I love the idea about the 2x4s for the cans! I just might have to copy! Thanks for the inspiration! Ahhhh...I'm soooo jealous...I would loooove to have a "Cool" looking pantry like yours!!! way to rock it out, girlie!! oh, WOW! this is awesome! Can you come and do mine! Oh...my pantry is doing OK, but I'd love to have it look pretty like this! I totally love your organization!! Great job! Oh wow! This is heaven. I am sure you are so excited about this makeover. I really LOVE your wall color. Organization makes me happy! Your pantry is a dream. Oh wow! This looks so amazing. I love everything about it. What a beautiful, organized pantry. It's such an inspiration. Thanks for sharing at we're Organized Wednesday. Wow! What a wonderful pantry! You inspired to redo mine and think outside the box on storing items. Looks fantastic! Wanna come do mine???? Oh I LOVE it!!! My pantry may be the twin sister to your "before" pantry! I am so inspired - If I ever get my bottom in gear and organize my pantry, it WILL be a total knock off of yours! Your pantry is lovely! 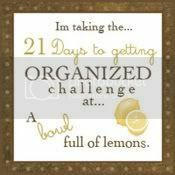 Thanks so much for posting...it's inspired me to continue getting mine at least organized if not 'prettified'! Oh, so great! I wish my pantry was that big. But maybe I'll start with the storage room and when we get a bigger pantry, just move the organizing in there. Thanks for posting this. Such a great idea! YOu are hired...beautiful...first time here...need to browse some more..
Wow! How awesome. I really like how you used lots of different types of containers and jars, instead of all just one type. It gives it a nice look! WOW! The yellow is perfect and the baskets help so much. Very nice. pantry love is impossible to describe and explain. can we become best friends? This is so, so, so fabulous! I *wish* had a pantry to do this!!!! LOVE! I could do the jars with sugar and flour I guess and put them on my counter. I guess that would make it easier to use. I keep my flour in the freezer now but if it's in a glass jar no buggies can get in. Well done on this pantry makeover! Looks great and seemed to make the pantry look a lot bigger too! Saw your link on Funky Junk Interiors. Your before pic looks like my pantry right now! You did an awesome job. My one concern with glass jars is that they're so heavy to move when full, but they sure do look great! I love the idea about 2x4 risers, esp. great because you can customize the size for your shelves. Fabulous job! Saw this on pinterest. Just my style. I love the label that you put on the clear jars (brown sugar, flour, etc.). Did you make or buy the labels.....or did you buy the jars that way already? They should be in the kitchen section. I bought the large glass jars from walmart. They had several sizes. Hope that helps! I love your pantry! I have a small one, but not that you can walk into. I got hubby to make me some 2X4 risers and they work wonderfully. I did get me some of the gallon glass jars from walmart and put them on a ledge of a fake kitchen window. Thanks for all the great ideas. I can actually tell what I have in my pantry now. Wow! That is a great pantry...love it! Wow, I had to look twice. Our pantries look almost exactly the same. Same wall color, same canisters with labels, same dark baskets...haha. Do you have directions on how to make the risers out of the 2x4's? I love this idea. This pantry redo officially makes your blog top stalk status!!! I am now following you and wiping drool from my computer. For the risers, I literally just stacked 2x4's on top of each other. For the back row, I measured how long my shelf was, and cut 3 2x4's that length. I stacked all 3 on top of each other for my back row. For the middle row of cans, I measured and cut 2 2x4's. I stacked those on top of each other and created my second row. My front row of cans are sitting right on the shelf. Hope that helps! I just finished my pantry based on your inspiration (bins & risers). It looks great! Thanks! Wow your pantry looks great!! I love all your labeling and putting things into a container, it helps so much with knowing where things are. I really like your can good idea. Great job on the pantry!! Giveaway Winner and DISCOUNT code! Say it on the Wall Giveaway!